Level goal: To gain access to the next level, you should use the setuid binary in the homedirectory. Execute it without arguments to find out how to use it. The password for this level can be found in the usual place (/etc/bandit_pass), after you have used to setuid binary. In this level, we will be working on a file which has its setuid set. 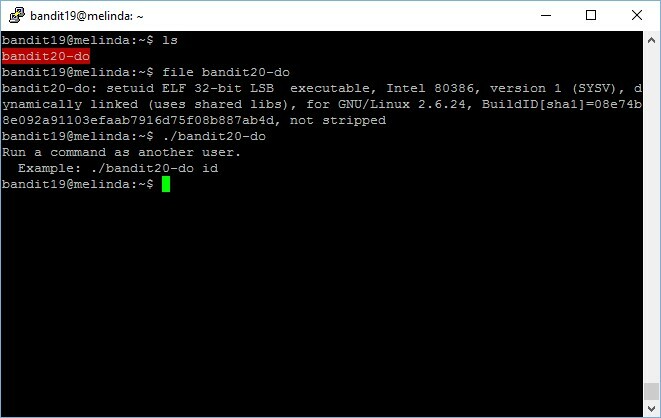 It’s interesting because it allows us to run a command or do anything as bandit20. The password to gain access to the next level is GbKksEFF4yrVs6il55v6gwY5aVje5f0j. Level goal: The password for the next level is stored in a file readme in the home directory. Unfortunately, someone has modified .bashrc to log you out when you log in with SSH. In this level, we need to connect using the ssh -t. The -t parameter basically opens a pseudo-tty within the session, with output in the same screen. The ssh session closes when the command completes. 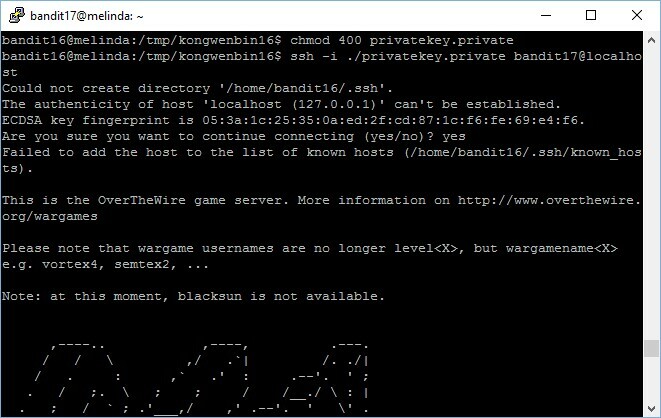 This way, you can quickly run a command before the connectivity closes and kicks you out with a “Byebye!”. 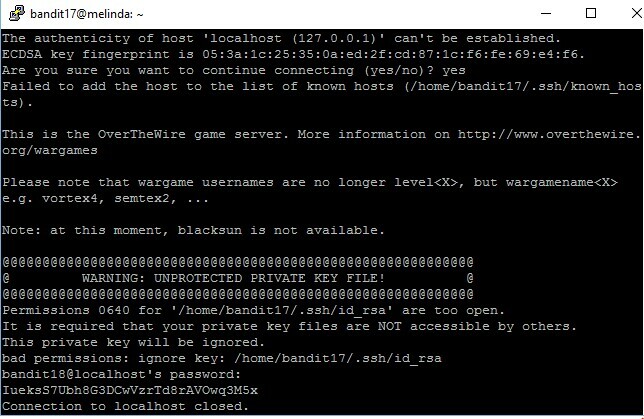 Permissions 0640 for '/home/bandit17/.ssh/id_rsa' are too open. 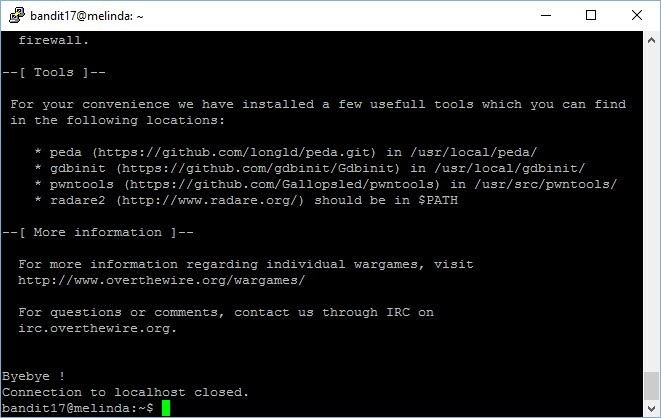 Next, we run the same commands to check what is in the “readme” file. The password to gain access to the next level is IueksS7Ubh8G3DCwVzrTd8rAVOwq3M5x. NOTE: if you have solved this level and see ‘Byebye!’ when trying to log into bandit18, this is related to the next level, bandit19. Here you see 2 password files. As the hint goes, New vs Old, the first thing to come to mind is to perform the diff function. The password is kfBf3eYk5BPBRzwjqutbbfE887SVc5Yd. 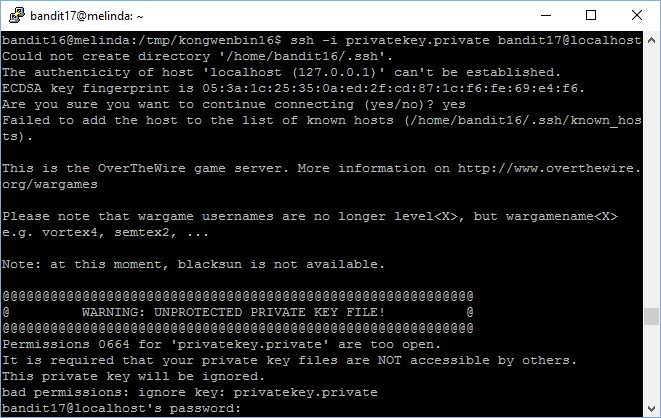 To verify whether this is the correct password, we will follow the hint, which is to try to connect to bandit18 and see if we see the “Byebye!” message. The password to gain access to the next level is kfBf3eYk5BPBRzwjqutbbfE887SVc5Yd. This level require us to have basic understanding in port scanning and identifying the services. First, let’s perform a port scan to identify the open ports between the range of 31000 to 32000. 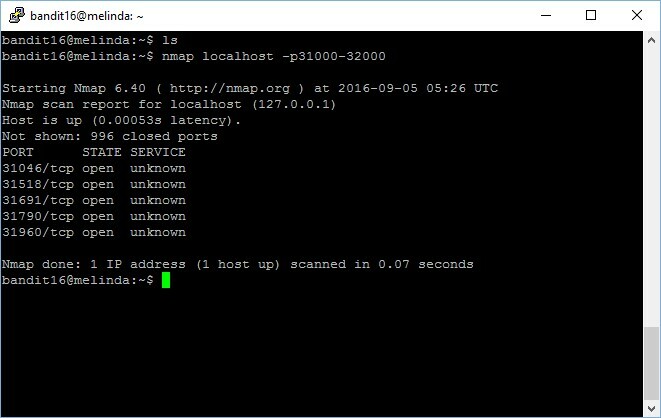 Connection to localhost 31046 port [tcp/*] succeeded! We see that port 31046 is able to accept non-SSL connection, which means that this is not our target. Let’s check out the other 4 ports as well. 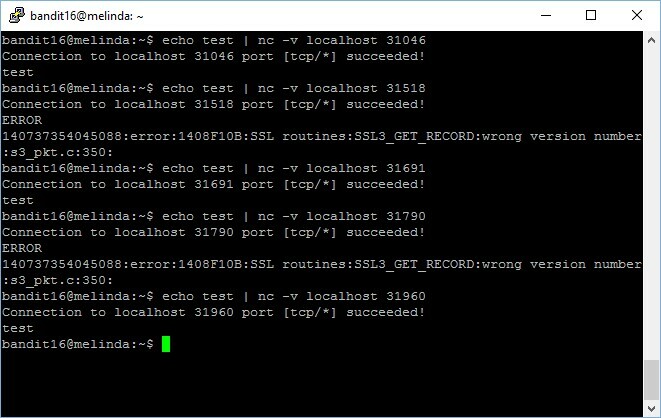 Now, we will focus on the 2 ports which produced error output because they are configured to restrict connectivity to SSL only. 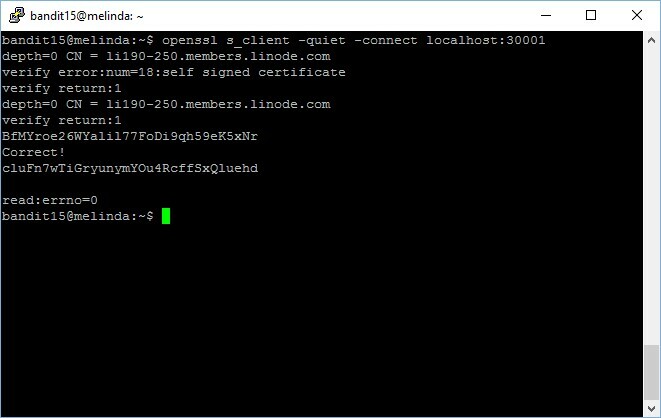 We will now try to connect using openssl with s_client option, to check if there is any correct output. 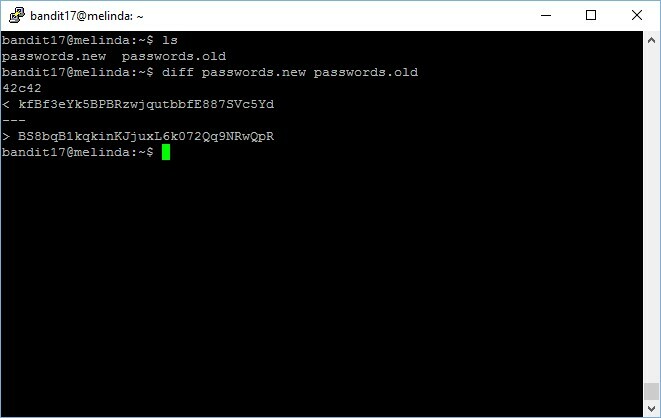 The private key for accessing the next level is stored in port 31790! Now, I have to save this RSA private key into a file and then use it to connect to the next level. The fix is very simple, simply modify the file permission and set it as 400 and you are good to go! There you go, you are in! Level goal: The password for the next level can be retrieved by submitting the password of the current level to port 30001 on localhost using SSL encryption. In this level, we connect to the port 30001 on localhost using the SSL encryption. We can do it using the openssl command. The password to gain access to the next level is cluFn7wTiGryunymYOu4RcffSxQluehd.